From loose stitches to needles breaking, learn how to troubleshoot sewing machine issues with this beginner sewing guide. Nothing feels better than making something beautiful on your sewing machine. It's become incredibly popular again as people have started to really value handmade items rather than mass-produced goods. But there will always be the occasional sewing machine snafu if you do it for long enough. From tension issues to bobbins running out to needles breaking, I've seen it all. Let's sort out the likely causes of these headaches and look through these 9 Common Sewing Machine Problems and Solutions. It can be difficult to figure out why your sewing machine is not sewing or why your sewing machine needle keeps breaking if you're new to sewing or don't know your machine well. Though, honestly, even people who sew on their machines every day run into these common problems, too. Editor's note: For more detailed information specific to your particular machine, always consult the instruction manual. Most can be found online if you can't locate the original paper copy. However, if you don't have the manual or can't find it, many of these issues are universal. This sewing machine issues guide should certainly lead you in the right direction. If the thread is bunching up under fabric, it will put an immediate stop on your sewing. The dreaded "bird's nest" on the underside of your fabric. The top thread looks okay but the underside is a total mess! I put this at the top of the list because it's so frustrating and time-consuming. To solve this problem, you'll have to totally unthread and then rethread your machine. Make sure you take the bobbin out and also check that the top spool is facing the right way as some thread brands have a "top" side. Make sure the issue is fixed by doing a tester on a scrap piece of fabric before continuing with your project. You can't sew if the needle is broken! This typically happens right in the middle of an important line of stitches. Changing your needle after every big project or every eight hours is recommended, or sooner if you notice that it is bent or damaged in any way. A package of needles is pretty inexpensive and can keep your machine running smoothly. Always change it using the little screwdriver provided with the machine, and be sure the needle is facing the right direction that is specified in the instruction manual. If you've inserted a new needle but it keeps breaking, check that your machine isn't full of lint (more on that below). Using the wrong needle for the project (click on the image below to learn about machine needles), sewing over straight pins, using very thick fabric, and improper threading can also be the culprits. If your fabric is bunching, puckering, or wrinkling when you're sewing, the finished piece will not be in the condition you are looking for. If you're sewing really delicate, thin, or slippery fabric (like chiffon), you've probably experienced some bunching or wrinkling. If this occurs, you should first check your sewing machine's tension and stitch length. When the top thread's tension is too high, it can cause wrinkling and odd stitching. Doing a sample on a scrap of fabric (that is the same as your material that's bunching) can help you know if the problem has been fixed. Learn more with this page, What Causes Puckering When Sewing? If your sewing machine skips stitches or the stitches don't look right, it can be frustrating. Very loose stitches are typically caused by tension that is too loose. Tension settings on every sewing machine are different, but you generally want to start by gradually adjusting the top thread's tension before trying to change the tension of the bobbin (the bottom thread). Reading your machine's manual will give you more specific steps to follow. Also, inspect your machine for a buildup of lint, improper threading, an incorrect bobbin for the machine, or even a bent needle. Many newer sewing machines come with an automatic needle threader feature. This is great if you have don't see very well or if you have trouble threading a machine. But they can be precarious to use and if not done correctly, the thin wire that pulls the thread can bend and stop working. You should always read the manual before attempting to use this tool, and even check out online videos online of your particular machine. Always make sure that the needle is in the right position (the eye must line up) and that the thread and needle aren't too thin or too thick, as this can throw off the balance of the automatic threader. It's crucial to regularly clean your sewing machine (in addition to professional cleanings and tune-ups once a year). 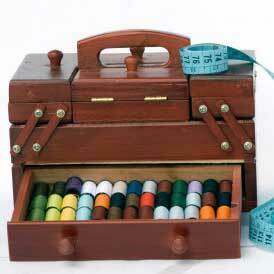 This prevents a variety of issues including your bobbin getting stuck and the needle breaking. Unplug and then remove all the thread, and gently take out all the debris with a little brush and tweezers. Don't ever blow into your sewing machine when cleaning it - this can cause internal rusting due to moisture. To help keep your machine clean, make a DIY sewing machine cover that will help keep dust out. Sewing machine bobbin problems and solutions are common. One of the most common issues with machines involves bobbins. When your bobbin runs out in the middle of sewing, it can throw off your concentration and momentum. While there is no way to guarantee this won't happen occasionally, there are a few things you can do to prevent it. When purchasing a new machine, look for one with a low bobbin indicator and/or a clear bobbin cover or window. If you're using a machine that doesn't have those features (like the old trusty one I've used for years), there are a few ideas that might prevent the bobbin running out unexpectedly. Clear bobbins are an easy way to know when the thread is low. Also, check the level of the thread before you start sewing. One more tip that I've heard from experienced seamstresses: Use another bobbin as your top thread spool to give you an indication of when your bottom bobbin will run out. Occasionally you'll need to change the "foot" of your machine. For most projects, you can use an all-purpose foot, but for more specific jobs, there are feet for zippers, buttonhole making, quilting, and more. Every machine is different, so always consult your instruction manual. But many machines follow the same basic model, especially if they use snap-on feet. First, make sure your machine needle and presser foot are at the highest position. Next, unplug your machine for safety Then use a little screwdriver to remove the screw above the presser foot that's currently attached, unscrewing it until the foot comes off when you push down on it. Then line up the different presser foot you want and snap it on, then put back the screw. If you're having trouble loosening the screw or removing the foot, go slowly and not too forcefully - you don't want to break your machine. Technically this isn't a sewing machine issue, but it is important to know how to use a seam ripper if your stitching goes wrong. The key to proper seam ripping is to go slowly and use good lighting so you can see well. If you don't pay careful attention, you might accidentally rip the fabric or poke your hand! There is no one right way to remove stitches, and there is even controversy about which way the little ball end should face. Some people say it should be on the bottom, and others prefer to use the pointy side against the fabric. As long as you catch a loop (typically by gently pulling the end of the thread) and start ripping from there, proceeding carefully, you should have no issues. Learn more with our page, How to Use a Seam Ripper. What other problems have you had while using your sewing machine? My machine makes a clinking noise about every 3 or so stitches. Also every 3rd stitch is longer. What's up? I have cleaned it, placed new needle, rethreaded it and checked the bobbin numerous times. Time for check up? excellent suggestions! I have had all of these issues over the years. I break needles partly because the timing is a bit off and it sometimes hits the strike plate, so I need to take the old machine in for an overhaul. sometimes I pull the fabric tight and rush it a bit, overriding the timing and then bend the needle myself! The problem of running out of bobbin thread I sort of solved by having extra bobbins on hand that I bought on discount. If my project is large, I automatically fill two bobbins before proceeding.